If you thought the combination of Rob Thomas and Carlos Santana was “Smooth,” just wait until you try Capital K’s Tall Grass vodka and gin. It’s the work of Jason Kang, the distiller/owner/one of the most fascinating men in Winnipeg. (At only 33, his career path has seen him as a commercial diver, in various restaurant jobs, a furniture manufacturer, moving company worker, convenience store clerk, engineering student, and everything else in between). Most importantly for us, he has taught himself all about the distilling process – including how to assemble his own distillery, which he has done here in Winnipeg. 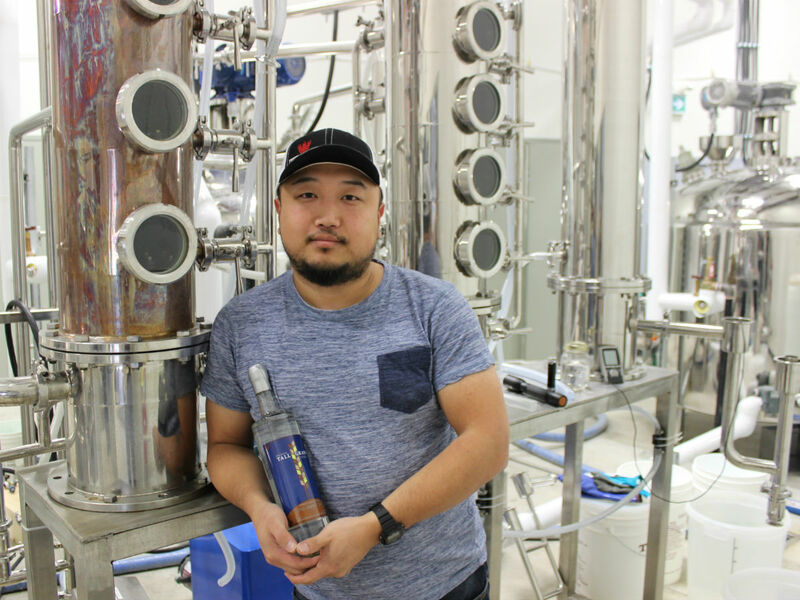 Kang started Capital K Distillery by procuring a space in an industrial park in the Summer 2015. He then started distilling in September 2016, with his premium vodka hitting Winnipeg shelves just about three months ago. (There was a bit of a marketing issue at first, as Capital K’s product was originally branded as Crystal Vodka, which a certain skull-shaped vodka took issue with). Anyway, Capital K’s vodka is now Tall Grass, a name more appropriate and so apropos considering what goes into the bottle (more on that below). It’s seriously one of the best vodka’s we have ever tried, while the gin – which will be released next week (Kang is just waiting on the new labels) – is absolutely brilliant. It is so clean, smooth and crisp (much like the vodka, which it is built upon – as is all gin), with a herbaceous, slightly piney nose and a flavour that melds the ten botanicals in a harmonious fashion, highlighting particular ingredients like chamomile (which you get at the back of your tongue) rose hips, and of course, a juniper (which constitutes 50 per cent of the botanical ingredients). We took a tour of Capital K this week with Kang where we conducted this spirited (and refreshingly honest) interview below. What goes into making Tall Grass Vodka? We use 100 per cent Manitoban-grown grain, all of which is non-GMO. By using the non-GMO stuff we are getting the most of the natural flavour from the grain itself. If you want to get a really good product with a lot of flavour in there, it has to begin from the source itself. We use 95 per cent white wheat, five per cent rye. We process [the grain] all here; by this I mean we mill the grain, are cooking it and fermenting it, distilling, diluting and then bottling it, all in this facility. So every single part of the process is under our control. I can almost 100 per cent guarantee that we are the first and only grain-to-bottle craft distillery in Manitoba. Well, things like potato are not ideal to process, and I wanted to have the grain flavour in it. Potato has it’s own flavour, but it is more towards the rough side of it. That’s why say certain Russian and Ukrainian vodkas can be a little bit rougher [if it comes from potato]. We were looking for something where the alcohol would be more smooth and clean, and would have a real fruity flavour to it. How did you get into distilling? Like most people, I started with homebrew. This was years ago, when I was young and [laughs] drinking quite a bit…. Back then buying liquor from a liquor mart was quite expensive for a young man without a good job, so I began to experiment with making other sources. I tried with wine, but that was very difficult… plus with one batch of homemade wine, people were saying you could get 30 bottles, but we were getting around 26, which took about two months to make… which you are then suppose to store for six months, so that’s like 8 months to make 26 bottles. That’s really not enough. So you just keeping working at it at home? Well, it took me years – it’s a different process, and a different product. I found different information and sources that I could learn from. Unlike brewing, where there are thousands of breweries and schools you can go to… there is nothing like that for distilling. If you are lucky you can find someone with a distillery. In the States, you’d go find someone say, making moonshine in the mountains and learn from them. I worked as a volunteer at a few distilleries for a week or so to learn the process [much like a chef doing a stage]… the main one being with a friend who is the owner of Big Rig Distillery in Alberta. I spent a week there working at his distillery and he was like an open book to me. How would you describe the flavour of your vodka? *note: My colleague Gillian and I readily agree with this. We were swishing the Tall Grass Vodka around in our mouths and there was no burning, while the flavours do develop once you swallow. The gin, as mentioned above, is not quite your classic gin in that the juniper Kang is using is fruitier than it is piney. After several incarnations he has it down that you can taste all the botanicals – which include rose hips, grains of paradise, cardamom, orange peel, lemon peel, lemongrass, chamomile and juniper – in a lucid fashion. It also has a fantastic bouquet. Capital K Distillery is located at Unit 3 - 1680 Dublin Avenue, Winnipeg. You can book distillery and tastings for up to 30 people here. Kang also does tours from drop-ins right now, and tours are currently free! Tall Grass Vodka is available in Manitoba Liquor Marts and retails for $45.99 (750 ml, before taxes). You can also buy it directly at the distillery.